The name of this title reminds me of an album released a long long time ago. I was involved in a minor motor vehicle accident about two years ago. I'd stopped my car at a wet intersection. I started to pull away once the traffic lights turned green, and at the same time a driver (from the opposing side of the intersection) turned across my path. I planted my foot on brakes as quickly as I could, the car's anti-lock braking system kicked in, but the road was too slippery - I t-boned the other driver's car on their passenger-side door. Given the relatively low-speed at which I hit the other vehicle, I was somewhat surprised at the impact of the accident, and the amount of damage both vehicles sustained. Fortunately nobody was seriously injured - probably because all involved had been wearing their seat-belts. But, the jolt from the impact made me realise how seriously-hard an immovable object must be when traveling at any speed over 20km/h. Posted in General and tagged rain, roads, water, wet on Wednesday, 11 July, 2012 by Paul. What a beautiful photo, where did you take it? So easy to spin the car on a wet road – I did that once on the road coming down from Hout Bay just passed Llandudno. The car spun on a wet, misty night. I think it was the road’s smooth surface and the white road markings that made the car lose traction. The next thing I knew the car had turned 360 degrees. I was on the opposite side of the road facing oncoming traffic. Fortunately I kept calm and didn’t apply the brakes, the car naturally came to a stop and I was able to put emergency lights on, re-start the motor and drive on. But you feel all shooken up afterwards, like you have seen a ghost and it was yourself! 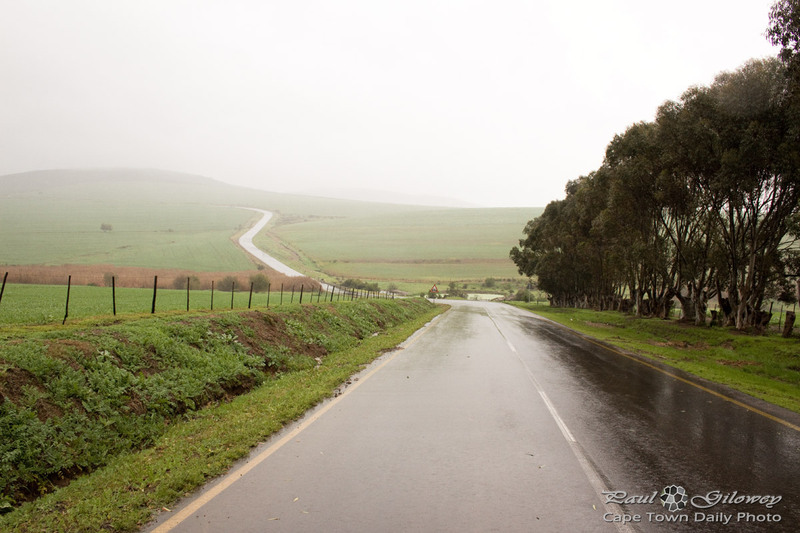 Thanks Pauline – I took the photo on one of the back roads of Durbanville. Here’s another photo of the same road, taken a couple of months ago. Yoh, just past Llandudno – that’s a dangerous spot! Luckily you never ended up over the edge, in Llandudno! Well, thankfully that thought didn’t cross my mind at the time! Lol.